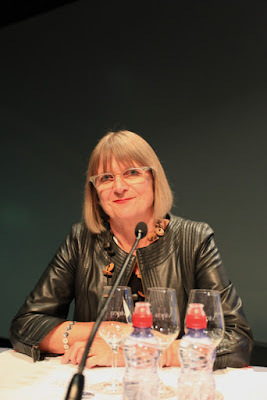 Jim's Loire: Jancis Robinson MW and Nick Lander (Mr Jancis Robinson) do not sell wine! Jancis Robinson MW and Nick Lander (Mr Jancis Robinson) do not sell wine! Producteurs du vin Prenez-Garde ! Jancis Robinson MW is one of the world's leading wine communicators. However, neither she nor Nicholas Lander, the restaurant critic and Jancis' husband, sell wine. This, however, has not stopped a fraudster or fraudsters pretending to be Nick Lander in order to scam producers out of wine. This is clearly a new twist to the unfortunately well established scam of pretending to be a wine buyer for an established UK wine company. There are clues from within the scam emails that this is a fraud. The most obvious is that the email address used editorials@jancirobinson.com misses the s in Jancis. Also the company name given is incorrect. If you receive one of these scam emails do not reply. Instead please forward it to Jancis. Jancis has contacted ActionFraud, so far to no avail. I am not surprised. Budget cuts to our police service must be affecting our police forces, who were already struggling to cope with the now huge amount of fraud around. If you pay for a Trabant you cannot expect a Bentley! We will be very please to build a business relationship with your company on a long term contract. So this will be at the same time an opportunity to establish a permanent business relationship. We strongly believe in the principle of working together as partners. In which everyone benefits - and these long-term relationships are vital to the continuing success of both parties. So we would be appreciate if you could send us your price list of : Wine, Champagne, Whisky for our order confirmation. And in the meantime, also open a credit line 14 days payment from date of invoice by credit insurance. Our terms of payment Strictly net 14 days payment from date of invoice after credit insurance this is not negotiable we are looking for wine suppliers to build strong relationships The key of success, both-parties-satisfied. Thanks as we hope to establish a long business relationship with your company. We are looking forwards to hear from you as soon as possible. Just above the telephone and fax numbers and the email addresses (none of them having any connection to us) is given our personal address and the number and VAT number of our company - all of these details freely available from Companies House in the UK. Soon after receiving this I sent an email to editorials@jancirobinson.com telling whichever fraudster was behind the attempted scam to stop, pointing out it was highly damaging to the genuine JancisRobinson.com. Later that day a wine trader based in Spain kindly forwarded me an identical email he had received, together with the complete details of the header, IP address etc, which yielded frustratingly little. I phoned the 0800 number at the bottom of the email and got a series of recorded messages such as 'For customer service press 1, for exports press 2' etc. I pressed 1 and, when no one answered, rang off. Less than 30 minutes later my phone rang (a very rare occurrence; I have almost entirely swapped phone for email) and a gentleman with a very deep, very unEuropean voice claimed, as soon as he heard my voice, to be seeking 'Pete in transport'. I challenged him, pointing out that I suspected he was the behind these scam emails. He insisted that he must have dialled a wrong number. I heard him looking down at my number (which begins 0207) and claiming he had wanted the same number that begins with 0208 (which does not, of course, exist as a genuine telephone number). For a short while we were worried that our extremely securely stored list of email recipients had been hacked, since both of the first two merchants to bring this to our attention are members of JancisRobinson.com. But since then it has become clear that the fraudster has been accessing lists of wine traders based in continental Europe that have nothing whatsoever to do with us. And is still sending out these emails today, Tuesday. It is a well-known ruse for a fraudster to try to order and have delivered expensive wines and spirits to an accommodation address and then to scarper without paying for them. But this scam - attempting to establish credibility as a wine buyer by pretending to be my husband, the well-known 'export manager' of JancisRobinson.com, reaches new levels of stupidity. I spend quite a bit on wine admittedly, but in general wine writers are not known to be major purchasers of high-value wines and spirits. And, I would hope, quite a few of the recipients of this email would know that (a) I am not in the business of establishing long-term trading partnerships with wine merchants and (b) I do actually know how to spell and punctuate.